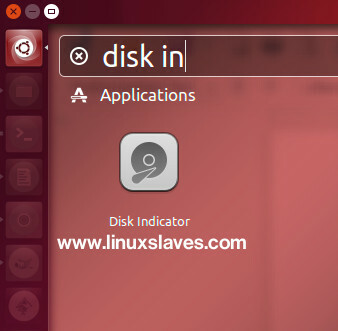 Disk Indicator for Ubuntu and derivatives - You might know well an applets icon that lets you to access, control, gave you an information from Unity's panel. There are plenty of indicator applets available for Ubuntu Linux e.g simple weather, network speed etc. And today, I've pooled all together 3 disk indicator to monitoring your disk and partition in Ubuntu desktop. Let's start! 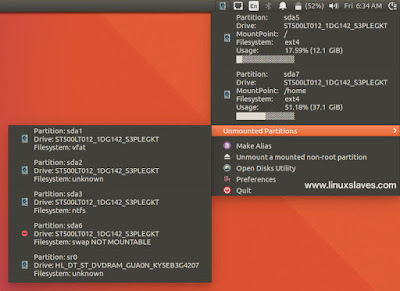 uDisks allows you to gets disk usage, view information about the mounted partitions in your Linux desktop easily. It's inspired by the iStat Menu 3 utility for Mac OS. 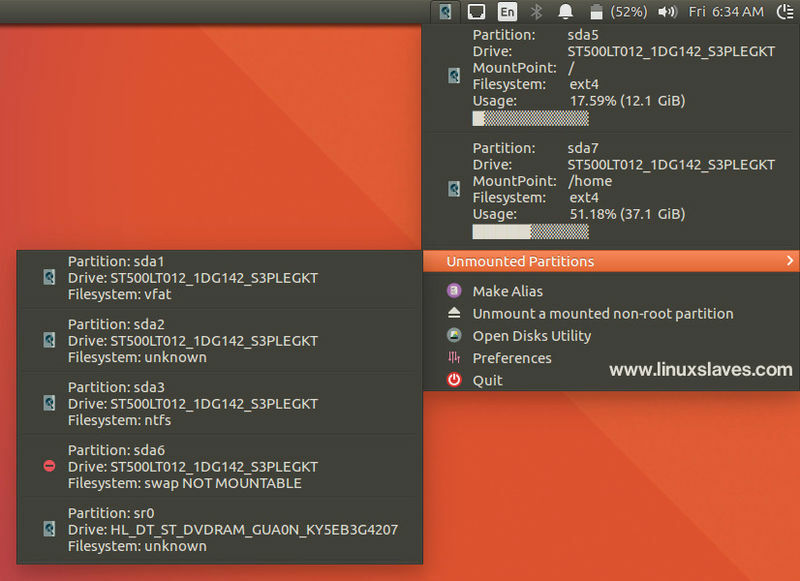 You can click on any listed of mounted partition in the indicator menu to open the partition's mount point in nautilus. The Unmounted Partitions menu allows you to quickly see and mount which partitions are available with a single click. Once installed, simply open uDisks via Unity dash, or other Ubuntu app launcher. Enjoy! 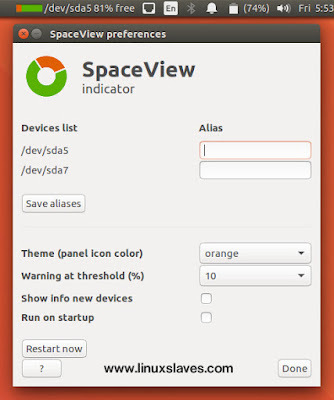 SpaceView Indicators an indicator for Ubuntu, showing the computer's devices and the usage. The indicator shows an icon of the "favorite" device, representing its usage. Options include notifications, showing usage of freshly connected devices, setting alias names etc. Basically, SpaceView enables you to see disk drive information about the system drives, memory cards, USB flash drives from system tray applet / Ubuntu's panel easily. So you no need to open Nautilus or other file manager. There's an option to show up the usage of freshly connected devices as notifications, and if you need you can add SpaceView to startup application in your Ubuntu. You can can make an alias, customize the theme panel icon color with orange, blue, purple, or yellow. You must hit "Restart now" button for the changes. SpaceView Indicator is available in a PPA. You can install it on Ubuntu 14.04 LTS / 16.04 LTS / 16.10 and derivatives system. Alternatively, you can manually get the deb ( there are i386 and amd64 package ) from its official PPA..
Or, you can install it via Gdebi package installer, or Ubuntu Software for GUI installation. Now you can open the app from Unity dash, Synapse launcher or similar app launcher. Indicator Indicator Diskman is a small and pretty simple tools to displays and lets you view and manage mounted drives, regular volumes, and partitions from indicator applet created by Tony George. Packages are available in the Launchpad PPA for supported Ubuntu releases including Ubuntu 14.04 LTS, 16.04 LTS and the most recent release, Ubuntu 16.10 and derivatives system e.g Linux Mint.